Ever since 2012 we have warned that one of the biggest threats arising from the US student loan bubble – which is no longer disputed by anyone except perhaps members of the outgoing administration – is not that it is soaring at an unprecedented pace, that’s obvious for anyone with the latest loan total number over $1.4 trillion, rising at a pace of nearly $100 billion per year, but that the government – either on purpose or due to honest miscalculation – was not correctly accounting for the true extent of delinquencies and defaults. Today, we finally got confirmation that, as speculated, the US government was indeed fabricating student loan default data, making it appear far lower than it was in reality. The admission came last Friday, when the Education Department released a memo saying that it had overstated student loan repayment rates at most colleges and trade schools and provided updated numbers. This also means that the number of loan defaults in various cohorts is far greater than previously revealed. And so, the infamous “glitch” strikes again. According to an analysis of the revised data, at more than 1,000 colleges and trade schools, or about a quarter of the total, at least half the students had defaulted or failed to pay down at least $1 on their debt within seven years. This is a stunning number and suggests that the student loan crisis is far greater than anyone had anticipated previously. It also means that the US taxpayer will be on the hook for hundreds of billions in government-funded loans once attention finally turns to who is expected to foot the bill for years of flawed lending practices. There is another interpretation: as we reported yesterday, when we revealed that a Chinese province admitted it had fabricated fiscal data for the period 2011-2014, the reason the data were made up “because officials wanted to advance their careers.” One can imagine that the career pressure for those government workers who would report, and be held accountable, for revealing the true picture of America’s disastrous student loan bubble, would be likewise staggering. Going back to the report findings, the student loan repayment rates were originally released in 2015 as part of the Obama administration’s College Scorecard, which followed an aborted attempt to rate colleges and tie federal funds to those ratings. At the time, the Journal reported that at 347 colleges and vocational schools, more than half of students had defaulted or failed to pay down their debt within seven years. Those figures were based on students were supposed to start repaying loans in 2006 and 2007. In September, the Department released data tracking students who should have begun repayment in 2007 and 2008, and that number rose to 477. But with the updated number released last week, that number grew to 1,029. Worse, no college saw its repayment rate improve under the revision, and some schools saw their seven-year repayment rates fall by as much as 29%. The worst offender was the University of Memphis which had one of the largest drops in its repayment rate following the recalculation. Previously, the Department said that 67% of its students were repaying loans within seven years of entering the repayment period. That number fell to 47% after the recalculation. The University was not happy. In a statement, the school said it “was not contacted by or made aware of the data changes” from the Education department. “Given the magnitude of the numerical changes in the report released by the Department of Education, the University of Memphis will be challenging the accuracy of the newly adjusted data,” the statement said. The far more dire implications, however, are for broader student loan market, because if the latest unfabricated data suggesting that loan delinquencies are rapidly rising toward 50% across most of America’s colleges, then the US is facing a default problem of staggering proportions. 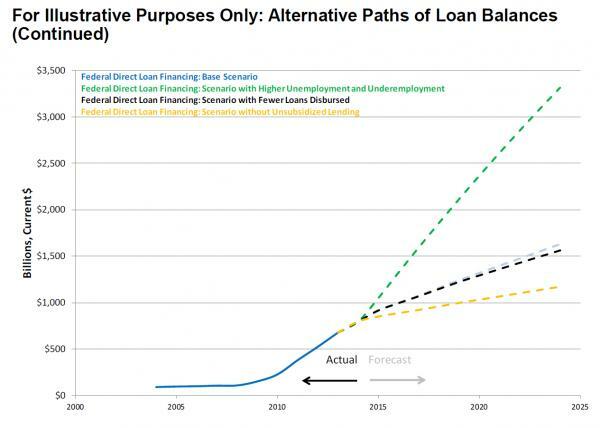 Recall that back in December 2014, The Treasury Borrowing Advisory Committee forecast that in an aggressive scenario, as much as $3.3 trillion in student loans could be outstanding by 2024. Incidentally, that is the scenario that has captured the growth of student loans since it was presented. Apply default rates of 40-50% to this number, and the bill to the US taxpayer for the next mass bailout starts taking shape. This entry was posted in Education, Government, World News and tagged Collage Education, Education, Government, Government Screw Jobs, student loans, US Government Caught Massively Fabricating Student Loan Default Data. Bookmark the permalink.